Maybe, with hindsight, China would have done things differently. If it had not made such a huge fuss about the award of the Nobel Peace Prize to Liu Xiaobo, the world's press would not have come to Oslo in such large numbers to report on the ceremony. And if China had not tried to strong-arm countries with diplomatic representation in Norway and persuade them not to send their ambassadors to the ceremony, then it would not have got into a contest with Europe and the United States - something it was never going to win. As it was, only 16 other countries, many of them heavily dependent on China, boycotted the award. Some who changed their minds, like Serbia, showed clear signs of being counter-strong-armed by Europe or the US. It is unwise to get into diplomatic battles of will with this degree of publicity unless you are likely to win them. And for Russia to get involved in a dog-fight on the side of a country being heavily criticised for its human rights record was scarcely a very good idea either. Perhaps China should have done what Iran did, when the Nobel Peace Prize was awarded to the Iranian human rights campaigner Shirin Ebadi. The government in Tehran complained loudly that it was being insulted and traduced, but when Ms Ebadi came to Oslo to pick up her prize, the Iranian ambassador was sitting there at the front of the audience, applauding. That defused the entire public relations problem for Iran. Later, in a police raid on some of her property, the golden Nobel medal was confiscated. But by then the fuss, and the international awareness, had long since died down. This has all been a public relations disaster for China. The symbolism of the empty chair was pretty damaging. The only regimes that have imposed it on the Nobel Prize Committee in the past have been of a kind which China would not want to be compared with: Nazi Germany, the old Soviet Union, Poland under martial law, Burma. Other elements of the ceremony increased the embarrassment, such as the children's choir, which sang at the request of Liu Xiaobo himself. He had managed to tell his wife that he wanted this to happen. For the Nobel committee, the children symbolised the future, free of political control and police interference. Even though he was in his prison cell in China, Liu Xiaobo's presence dominated the entire ceremony as though he were there in person. The Peace Prize ceremony has come at an awkward moment for the Chinese leadership. During the past few months there has clearly been a battle at the top of Chinese politics about whether to allow a greater degree of free speech. The conservatives, remembering how glasnost, greater openness, helped to bring down Mikhail Gorbachev's Soviet Union in 1991, demanded that there should be no let-up in the controls on what people can say and write. For a time, liberal academics and politicians argued that more freedom of speech would help the general opening up of the country and ease social tensions in China. It is a battle which the conservatives have so far won. The official line is that Liu Xiaobo is a wrecker, putting everything that China has achieved in danger through a return to anarchy. Many Chinese people clearly agree. But it is important not to misunderstand what is happening there. Liu Xiaobo may not have been allowed to sit on the platform at the Nobel ceremony, but that does not mean that China is just like all the other practitioners of the empty chair policy. 2009: jailed for subversion for 11 years; verdict says he "had the goal of subverting our country's people's democratic dictatorship and socialist system. The effects were malign and he is a major criminal". 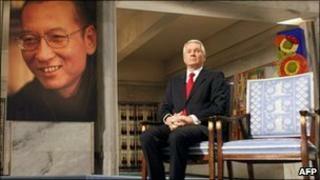 Liu Xiaobo: the right choice? It is not, of course, anything remotely like Hitler's Germany. Nor is it like the Soviet Union. We have seen from Wikileaks in recent weeks how irritated Chinese officials have become with closed countries like Burma and North Korea. Senior Chinese civil servants tend to be sophisticated and very aware of the demands of China's new status. Even China's secret policemen understand that times are different, and that they cannot behave as they once did. And if you meet Chinese dissidents, most of them - even those under house arrest - will tell you they think things are slowly getting better, and that eventually they will win their ideological battle. Liu Xiaobo seems to think the same way. To allow itself to be pushed into a position where it can be represented as in some way a successor to the savage dictatorships of the past was a serious miscalculation. It will not have helped the position of the conservatives whose annoyance and frustration at the Nobel Committee boiled over in this ill-judged fashion. Maybe the whole Nobel experience will provide important lessons for the next Chinese leadership, which will probably be announced formally in the autumn of 2012. Liu Xiaobo may have to stay in jail for some time to come. But the award of the Nobel Peace Prize means that the new leadership will see him as a dominant figure in the dissident movement.